I have always enjoyed sewing - since I was a child. I started with sewing for my dolls and was sewing my own clothes by the time I was in 8th grade. Shortly after we got our first computer I discovered that seamstresses were selling homemade clothes for the dolls of my childhood (50's & 60's) on eBay. I was excited to see this and knew immediately that I'd found an outlet for my creative skills. My interest in dolls reawakened and I become somewhat of a collector. 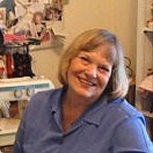 Since 2001 I've been sewing for certain dolls and been a member in numerous doll groups for collectors on Yahoo. My preference is sewing for 1950's hard plastic and vinyl dolls that are deemed some of the most collectible and valuable. I also repair vintage doll clothing, including replacement of elastic, and major restorations of valuable tagged clothing by Madame Alexander. Madame Alexander dolls such as Cissy, Elise, and Lissy are 3 of my favorites from that company but I sew for some of the others from that era as well. I also sew for modern Cissy. I sew for the Uneeda 14" and 20" Dollikins, for the Ideal Revlons in almost all of their sizes and for the 10 1/2" Little Miss Revlon and all of her friends from various companies that made a fashion doll that size. One modern doll that I sew for is Horsman Rini, who is a remake of Uneeda's 14" Dollikin - same body dimensions but new face sculpt. I have sewn a bit for the American Girl 18" dolls but only when requested. My joy is the high heeled fashion dolls of the mid-late 50's and the little girl type hard plastic dolls of that era - Ideal Toni, American Character Sweet Sue, Madame Alexander Maggie and Binnie. My special joy for the fashion dolls is their lingerie and petticoats in particular. There's nothing more feminine than all that taffeta, tulle, and lace. Some of my friends refer to me as the "Petticoat Queen" and for one year I did have a Petticoat of the Month Club for some of my fellow Madame Alexander Cissy collectors. I named my doll clothing business "DollDreams By Natalie" because I day dreamed about doll clothing while at work, dreaming up outfits and designing in my mind. The name just seemed right. Thank you again for visiting my site - I look forward to hearing from you!